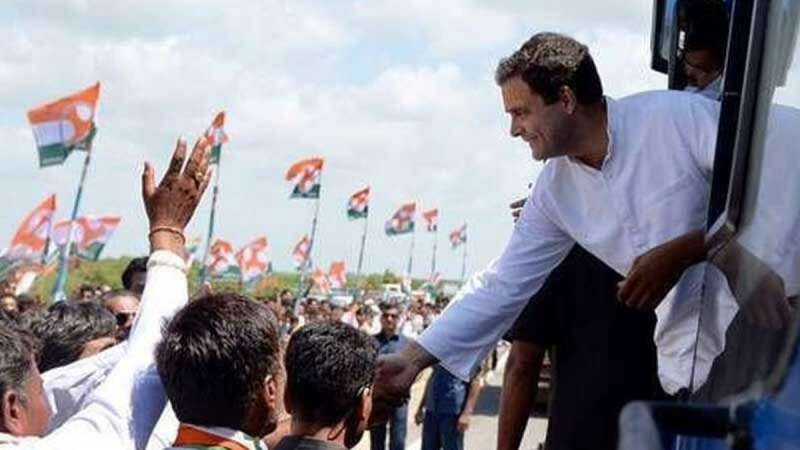 New Delhi : Congress President Rahul Gandhi on Tuesday said the Gujarat election result has dealt a "massive jolt" to the BJP and raised questions about Prime Minister Narendra Modi's credibility because of his silence on corruption charges including BJP chief Amit Shah's son Jay Shah's meteoric business rise. "This election, which Narendra Modi called election of development, and put a stamp on GST... But he did not speak about development, GST and note ban in his election speeches. It has raised questions about Modiji's credibility. Frankly, Modiji has a credibility problem," Gandhi told reporters outside Parliament, a day after the Congress lost to the BJP both in Gujarat and Himachal Pradesh. He was replying to a question on Modi's remarks on Monday that the Gujarat verdict showed that the campaign of casteism had been defeated by development agenda and that voters had given their approval on GST. "I am talking about credibility. Modiji spoke non-stop about corruption but didn't utter a word on Jay Shah and (French fighter jets) Rafale. The nation wants to know why Modiji is not speaking a word on how Jay Shah converted Rs 50,000 into Rs 80 crore in three months and the Rafale scam. This is the credibility issue," Gandhi said. Speaking about election results, he said three months ago it was said that the Congress cannot fight the BJP. "But in three months we did solid work. You saw the result. For us, it is a good result though we lost. We could have won. But the BJP suffered a massive jolt in Gujarat." Gandhi said the Gujarat model of development had been exposed and had not been accepted by the people. "The propaganda was good, marketing was good but it was hollow within. I saw it there (in Gujarat)." He said the Gujarat election also taught him a message that whatever hate and anger combined with endless resources on the other side should be responded with love and brotherhood. "And I thank the people of Gujarat and Himachal Pradesh and congratulate the winners."